Because you can really never have too many chicken recipes (am I right? ), today, I present to you my new favorite chicken recipe. YES, I SAID FAVORITE. 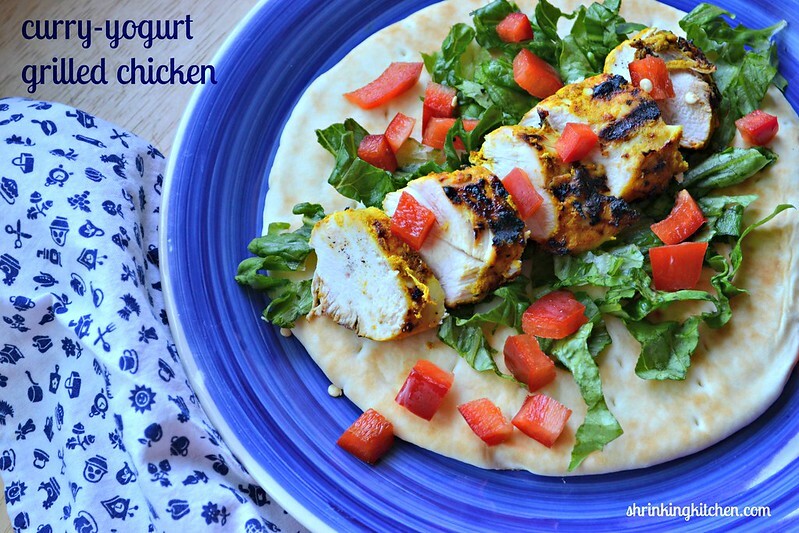 Now, it’s a fact that I can be rather dramatic about food, but for right now, this very minute, this Curry Yogurt Grilled Chicken is my very favorite chicken recipe. Why? Well, I’m going to tell you. It is perfectly seasoned, it’s tender and it’s not dry, as chicken breast tends to be, especially on the grill. Not to mention that it’s versatile – you can serve it as is, with a nice veggie side and call it dinner. Or you can slap it on a pita with some crisp lettuce and peppers and maybe a little yogurt dressing and you’ve got an awesome sandwich. Then there’s MY favorite way, in a salad. Stay tuned, because later this week I’ll show you how to use this chicken in one of my all time favorite salads. The suspense is killing you, right? You might balk at the time it takes to marinate this chicken. I’d recommend getting it in the fridge right before you go to bed the night before you plan to serve it – that’s about 5 minutes of hands on time. Then, the next day, you just throw it on the grill. That’s pretty simple, people. I know you can handle it! So get the ingredients and get marinating! Whisk together the yogurt, garlic, ginger, curry powder, cayenne and lemon juice. Pour into a zip top bag. Slice your chicken breast lengthwise into strips. Place the chicken breast into the yogurt marinade and press out as much air as possible, then seal. Squish the chicken around in the marinade to cover. Place in the fridge to marinate for at least 4 hours, up to 24 hours. Rub your grill grate with a paper towel dipped in olive oil. Remove the chicken from the baggie and place onto the grill. Reduce the grill heat to medium. Grill about 6 minutes on each side depending on thickness - internal temp should be 165F. Remove the chicken from the grill and serve! Mid-thirty something wife, mother of two, runner, yogi and wannabe renaissance woman striving to look and feel even BETTER than she did before babies. My kids aren’t curry lovers so I changed the seasoning to 1T Greek seasoning, the yogurt, the lemon juice and the garlic, served in a pita bread with lettuce and tomato. DELISH!!! !